Be sure to view the video above to better appreciate the seriousness of the European Debt Crisis. The Bible prophesies a coming union of nations in Europe that will be the next global superpower. In the near future this coalition of nations will become a great military and economic power that will impact all the countries of the world. This final resurrection of the Roman Empire (remember, the European Union was formed by the Treaty of Rome in March of 1957) will comprise nations led by ten kings [or leaders] who have no kingdom as yet but they receive authority for one hour as kings with the beast (Revelation 17:12). This beast power will then fight against Christ at his 2nd coming, making “war with the Lamb”—verse 14. Germany will play a pivotal role in this emerging Beast power. In today’s world nations are judged according to the power of their military, and even more so by their economic might. Germany dominates Europe primarily because it is an immense economic power. German influence in the world is only now beginning to be fully appreciated. The German-dominated European Union is the world’s biggest single market. That’s why news out of Europe can cause major swoons in the American stock markets. As Europe’s industrial powerhouse and the world’s second largest exporter; the German economy has single-handedly stopped the Euro zone from spiraling into a depression. It was the only European nation rich enough to save the European Union from imploding. Why was this so very important? The answer is economic in nature. Europe is the world‘s largest exporter of manufactured goods, and is the biggest export market for more than one hundred countries. China and America need to do business with Europe. The European Union is the world’s largest trading bloc. If the European Union crumbles, then China and America will lose an important trading partner. This could trigger a global recession, as many American companies are heavily dependent upon selling their goods to the massive European market. The U.S. exported $268 billion to the EU in 2011. Total US investment in the EU is three times higher than in all of Asia. It is imperative for you to understand that the global economy needs a dynamic, growing Europe. Germany is the driving engine of the European economy. Germany is the largest economy the European Union (EU) and the fourth largest in the world (America, China, Japan and Germany). “Either the EU or the US is the largest trade and investment partner for almost all other countries in the global economy.” (see: http://ec.europa.eu/trade/creating-opportunities/bilateral-relations/countries/united-states/). Keep in mind that Germany is the supreme economy within the European Union. If European economies continue to shrink, Europeans become poorer and demand fewer American goods. Recession in Europe will translate into a stronger U.S. dollar against foreign currencies. When the dollar is more expensive, American exports are less competitive. Another fear is that American Banks have considerable exposure to European debt. The Bank for International Settlements (BIS) reports that U.S. banks had $638 billion in “Other potential exposures”—including CDS and similar instruments—to Portugal, Ireland, Italy, Greece, and Spain (PIIGS). The Beast’s global trade will include “merchandise of gold and silver, precious stones and pearls, fine linen and purple, silk and scarlet…every king of precious wood, bronze, iron and marble…fine flour and wheat, cattle and sheep, horses and chariots [military vehicles and cars in our day], and even the bodies and souls of men” (Revelation 18:12-13). A great barometer of our nation’s cultural health is seen in how we respond to the marriage covenant and the concomitant issues that revolve around our ability to value the marriage vow. According to a Pew research study only about half of Americans are married now, down from 72 percent in 1960. The age at which one first gets married has risen by six years since 1960. –56 percent of divorces involve at least one person in the marriage being obsessed with pornographic web sites. –57% of married people (men & women) who use the Internet social networking sites have flirted with another person who is not their spouse. –nearly 1 in 2 people have engaged in sexual conversation over the phone with someone they met “online”. — Couples who live together before marriage are 80 percent more likely to divorce than couples who don’t. –About 70 percent of couples getting married today have lived together before their marriage. There are consequences for our lack of respect for the marriage commitment. God will punish us for our “lusts” that destroy our families: They were like well-fed lusty stallions; Every one neighed after his neighbor’s wife. Shall I not punish them for these things?” says the Lord. “And shall I not avenge Myself on such a nation as this?—Jeremiah 5:8-9. 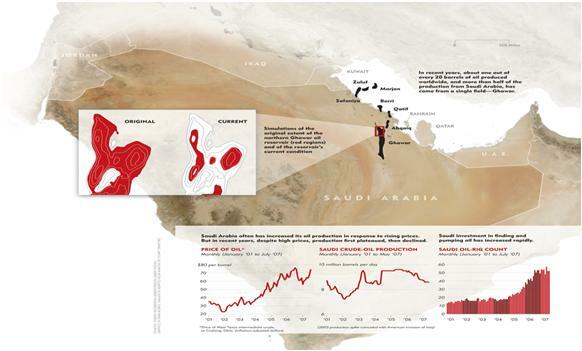 But wait a moment– what is often not reported is the world’s biggest oil fields are in decline. This will put pressure on world oil markets in the future. Three of the world’s biggest oil fields Ghawar in Saudi Arabia, Cantarell in Mexico and Burgan in Kuwait are older oil fields experiencing sizeable declines in their ability to produce oil. No country is more important to the world oil market than Saudi Arabia. The kingdom produced roughly 9.8 million barrels of crude a day last month. The world consumes about 88 million barrels of oil per day. Saudi Arabia is the world’s only producer with significant excess capacity; it has played a pivotal role in alleviating temporary supply disruptions. In recent years about one out of every 20 barrels of oil produced worldwide has come from the massive Ghawar oil field in Saudi Arabia. The Ghawar oil field is truly massive. Stretching for more than 150 miles beneath the desert, it is the largest known deposit in the world. It produces two times as much oil as any other field. That field’s ability to produce oil has peaked out. Finding new monster oil fields filled with easy-to-extract oil is extremely difficult. Many of the largest recent discoveries are under miles of water and seabed. The effort required to tap these fields will involve huge inflows of capital and years of drilling. As a nation, we use 19.2 million barrels of oil every day. We produce just 7.9 million barrels per day (mbd). Oil forecasts tell us that Saudi Arabia — and much of the Middle East — oil exports will drop rapidly over the next 7 years as their population growth swells. So let us understand the bigger picture: the surge of domestic oil production in America is only partially offsetting current decline rates of the largest oil fields in the world. Oil prices may decline in America, but that decline will not be permanent. We keep our eyes on the world of oil. Oil may be used as a weapon along with other weapons that “pushes” or provokes a European Beast power to move its headquarters into the Middle East. Here we are told that “the king of the South” will push against “the King of the North”—this pushing (provocation) will cause the Beast power to invade the Middle East where “many countries will be overthrown.” –(See Daniel 11:40-44). The world is so heavily dependent on oil and petroleum products—oil is bound to play a role –as nation lifts its hand against nation– as prophesied in Matthew 24:7. Keep your eye on oil and how it is used by nations to exert political influence. 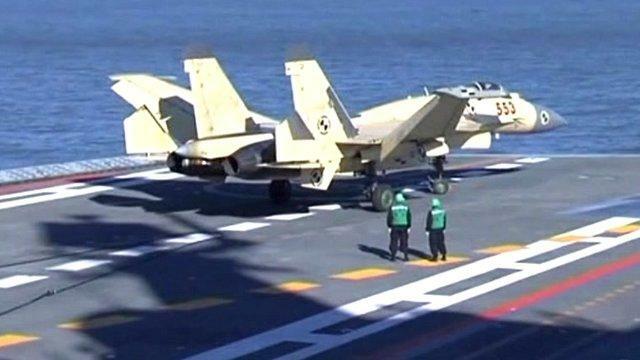 China has successfully landed a jet fighter on its new aircraft carrier for the first time, officials say. A Chinese-made J-15 fighter landed on the 300m (990ft) former Soviet carrier during recent exercises, China’s defense ministry said on Sunday. The Liaoning, China’s first aircraft carrier, entered into service in September. 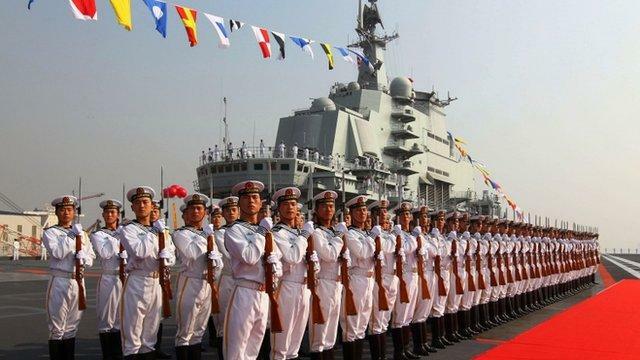 China says the vessel has had extensive sea trials and will increase its capacity to defend state interests. 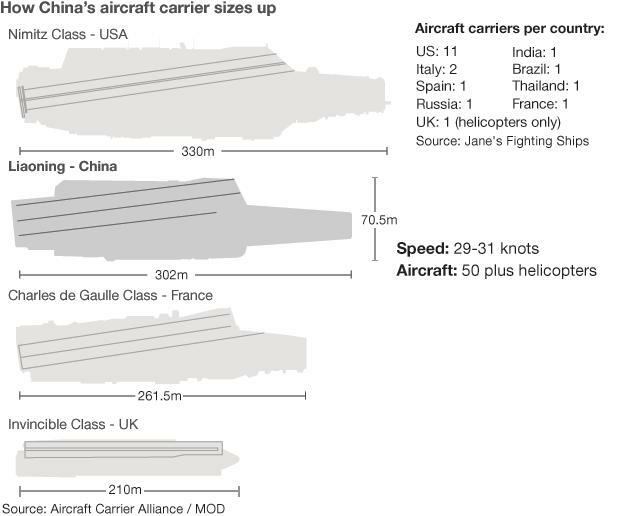 Analysts say the aircraft carrier will allow Beijing to help project its military might in territorial disputes. China’s state TV showed a hook on the rear of the J-15 catching hold of a cable on the deck of the vessel to slow the plane to a halt during the drill. The images of the carrier Liaoning recovering a J-15 jet fighter using the traditional arrestor hook and cables to bring the aircraft to a rapid halt, mark a significant moment: China’s public arrival as an operator of carrier-borne air power. Nonetheless the Chinese Navy still has much to do before it can be seen as having a truly operational carrier capability. The J-15 can carry anti-ship, air-to-air and air-to-ground missiles as well as precision-guided bombs, China’s official news agency Xinhua reported, citing unnamed naval sources. The aircraft carrier’s development comes at a time when Japan and other countries in the region have expressed concern at China’s growing naval strength. China and Japan are embroiled in a row over disputed islands in the East China Sea. Several South-east Asian nations are also at odds with China over overlapping territorial claims in the South China Sea. The country’s Communist leaders are spending billions modernizing their armed forces so they can project military power far beyond China’s borders.